On July 20th the Englewood Rotary "English as a Second Language" project team, which includes Judy Beggs, Katie Wright, Carole Youngren and Eldijana Bjelcic, will depart for Senegal. There they will meet up with their Senegalese counterparts in the small town of Géuoul. Through Skype, Katie Wright has had 8 real time and in person conferences with teachers and staff in Guéoul to collaborate and build this year’s e-learning program. 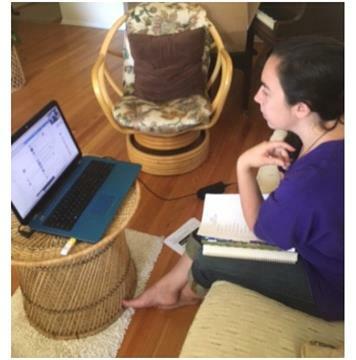 Does it strike you as fantastical and unbelievable that she is creating a program by in-person conversations with people 5400 miles away!!? 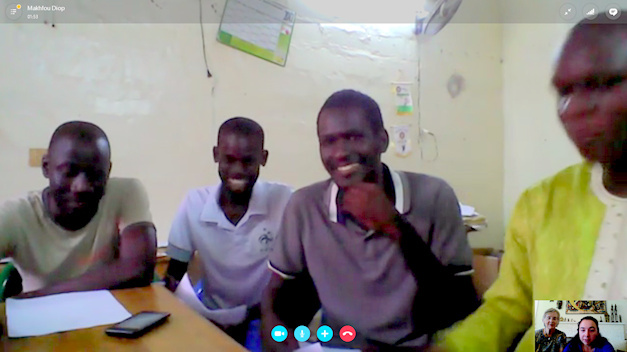 “Meeting with” Katie, from left to right, are Abdouleye Dieng, ESL teacher; Makhfou Diop, manager of computer classroom; Amet Seck, ESL teacher; and Abdou Fall, ESL teacher.